The third party can invoke the protection of Section 8 (1) (e) of the RTI act. 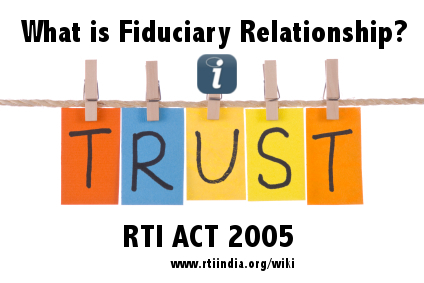 The traditional definition of a fiduciary is a person who occupies a position of trust in relation to someone else, therefore requiring him to act for the latter's benefit within the scope of that relationship. In business or law, it generally means someone who has specific duties, such as those that attend a particular profession or role, e.g. doctor, lawyer, banker, financial analyst or trustee. Another characteristic of such a relationship is that the information is given by the holder of information out of choice. When a litigant goes to a particular lawyer, a customer chooses a particular bank, or a patient goes to a particular doctor he has a choice whether he wishes to give the information. An equally important characteristic for the relationship to qualify as a fiduciary relationship is that the provider of information gives the information for using it for his benefit. It is true that such a relationship is based on trust. A person will not choose a doctor, lawyer, banker or trustee unless there is trust. All relationships usually have an element of trust, but all of them cannot be classified as fiduciary. Information provided in the discharge of a statutory requirement, or to obtain a job, or to get a license or passport, cannot be considered to have been given in a fiduciary relationship. In such a situation, it cannot be claimed that the information has been given in a fiduciary relationship. Fiduciary Relationship although arises out of a transaction involving trust between two parties, it requires something more than mere trust to make the relationship fiduciary. It also cannot be equated with mere privacy or confidentiality 1) At the heart of fiduciary relationship lie reliance, de facto control and dominance. A fiduciary relationship exists when confidence is reposed on one side and there is resulting superiority and influence on the other. The Canadian Courts have developed the following tests for determining whether the fiduciary relationship has been established, viz. The beneficiary is peculiarly vulnerable to or at the mercy of the fiduciary holding the discretion or power. The fiduciary is obliged to protect the interests of the other party. The traditional definition of a fiduciary is a person who occupies a position of trust in relation to someone else, therefore requiring him to act for the latter's benefit within the scope of that relationship. In business or law, we generally mean someone who has specific duties, such as those that attend a particular profession or role, e.g. financial analyst or trustee. The information must be given by the holder of information when there is a choice- as when a litigant goes to a particular lawyer, or a patient goes to a particular doctor. It is also necessary that the principal character of the relationship is the trust placed by the provider of information in the person to whom the information is given. An equally important characteristic for the relationship to qualify as a fiduciary relationship is that the provider of information gives the information for using it for his the benefit of the giver. When a committee is formed to give a report, the information provided by it in the report cannot be said to be given in a fiduciary relationship. All relationships usually have an element of trust, but all of them cannot be classified as fiduciary. Receivers, trustees in bankruptcy and assignees in insolvency/creditors. reference IN THE HIGH COURT OF KERALA AT ERNAKULAM W.P. (C) No. 6532 of 2006 (C) Decided On: 30.08.2010 Appellants: Treesa Irish W/o Milton Lopez Vs.Respondent: The Central Public Information Officer, The Appellate Authority, The Central Information Commission and Union of India (UOI).